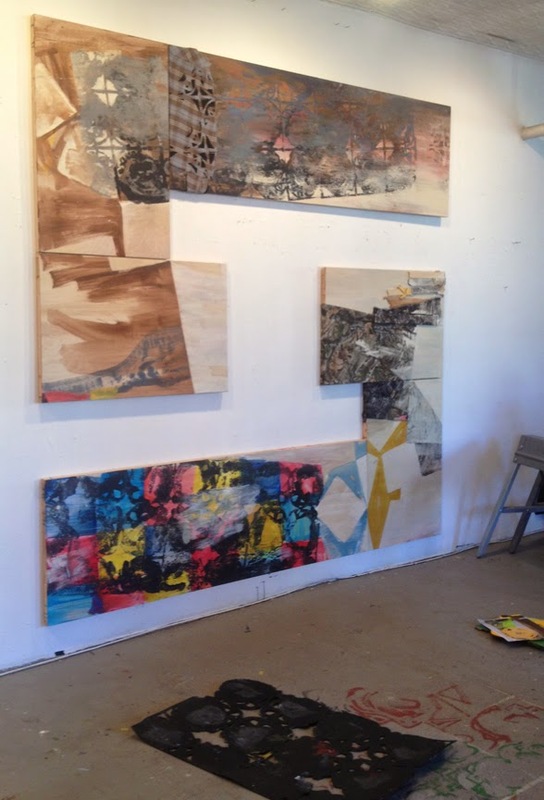 When I stopped by Suzanne Joelson‘s studio a few weeks ago, I found her working on several things at once, including two large paintings on hollow-core panels (doors in a previous life) and a series of painting-collages on paper. 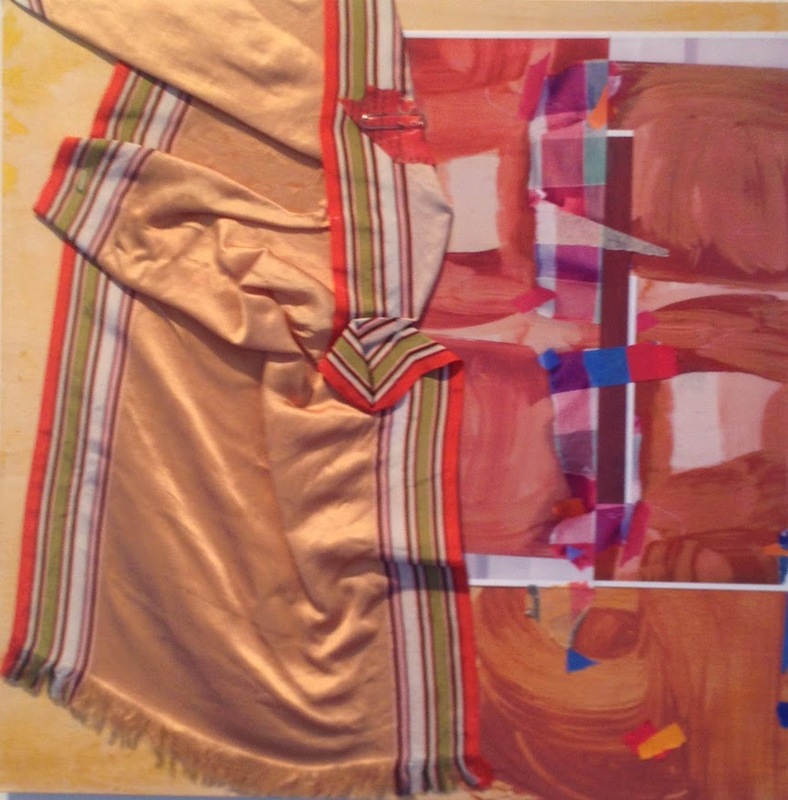 Recently I’ve been collaging scraps of clothing–primarily t-shirts from the salvation army–onto my paintings, so I immediately glommed onto the clothing, dishcloths, and other fabrics that Joelson had pasted into her inventive and evocative abstractions. 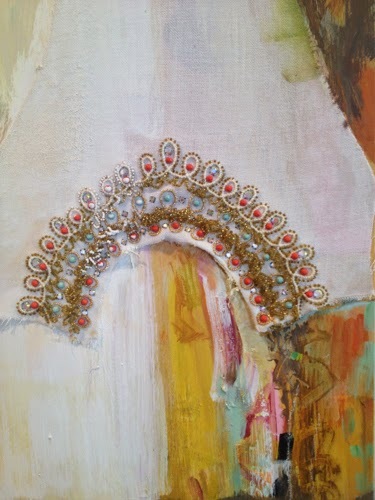 Detail of a larger painting. When turned upside down, the beaded neckline on this dress scrap conjures an architectural archway in Istanbul, one of Joelson’s favorite places. The Islamic tilework and repeating patterns that Joelson discovered during a trip several years ago with her husband, painter Gary Stephan, still influence her work. Since their first trip, she has twice returned to Istanbul to participate in exhibitions. Although she works abstractly, Joelson is fiercely interested in politics and current events, and the daily agitation prompted by the news informs her work. We had a long conversation about the aesthetic choices artists make, and how those choices can be rooted in matters well outside the history of painting. She showed me one series on paper that references newspapers, and her use of Islamic patterning quietly but clearly reflects her ongoing concern about the dire political challenges of the Middle East. Joelson pulling out some of the newspaper paintings. 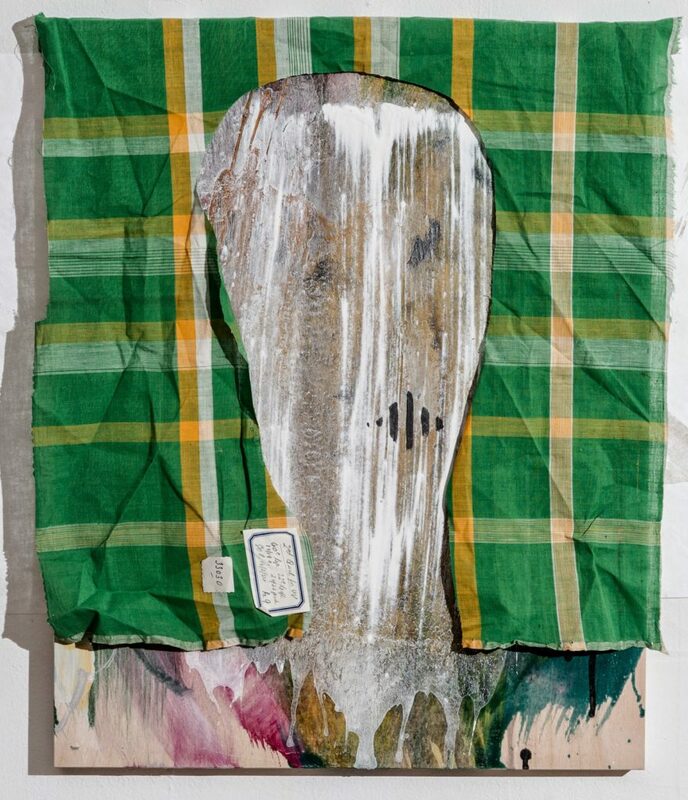 In addition to political adrenaline, the emotional detritus from daily life drives Joelson’s process. In early work, she made paintings the size of beds–singles, doubles, baby mattresses–and in newer work, materials such as her mother’s clothes rendered her paintings a record of personal experience and memory. 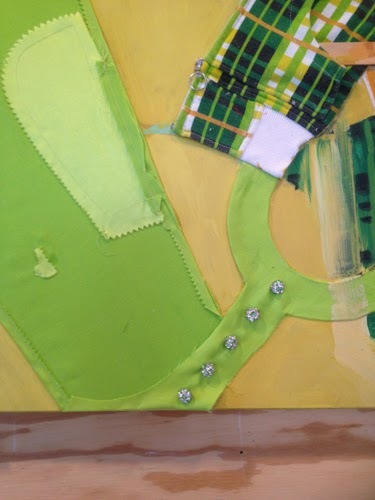 This detail from the large-scale painting above shows how Joelson has deconstructed and collaged pieces of her mother’s clothes onto the painted surface. This is a small painting, about 14 x 14 inches. Process has independent meaning for Joelson: how she creates images and objects is as important as they are. The detail pictured above reveals some holes where Joelson has hacked through the hollow-core panels. She told me how, during Hurricane Sandy, the basement of her building flooded and many of the paintings filled with water before she was able to lug them up the six flights of stairs to her loft. She then had to hack into the surfaces to get the water out and has continued incorporating this aggressive, cathartic gesture into her work ever since, to impressive effect. The panels’ interior structures are revealed in the holes, and their apparent solidity proves an illusion. 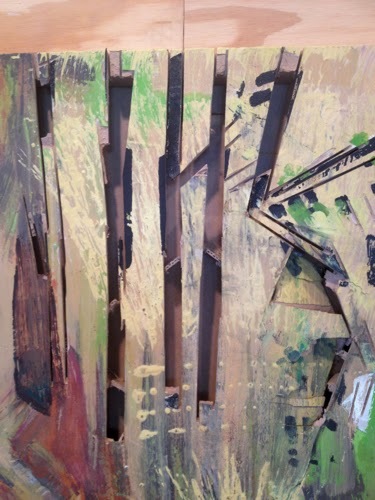 Indirect processes like printmaking also intrigue Joelson. 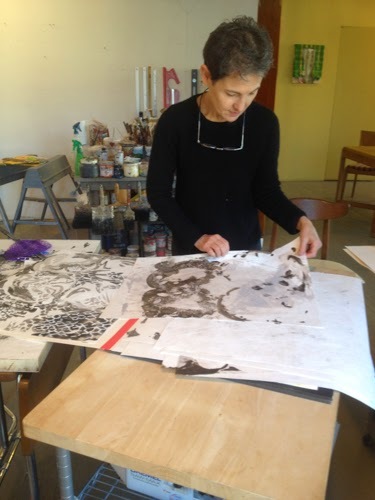 Using polystyrene sheets to create crude printing plates (one is pictured on the floor in image above), she cuts patterns, inks them up, and presses them onto the surface of the paintings. She expands the print images by pasting fabric on top of them and printing again, using the plate as a stencil or painting directly on top. 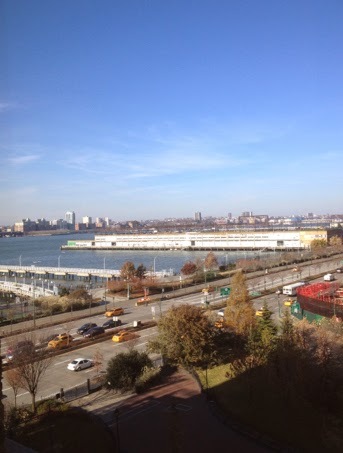 Here’s a snap of the dazzling view looking north up the Hudson from her loft on Canal Street, where Joelson has lived and worked for more than thirty years. As I was leaving, her neighbor Laurie Anderson was kind enough to ask me if I wanted her to hold the elevator. As Joelson works, her moves become less rooted in ideas and much more intuitive. And over the course of her career, she has become less tethered to painting conventions. 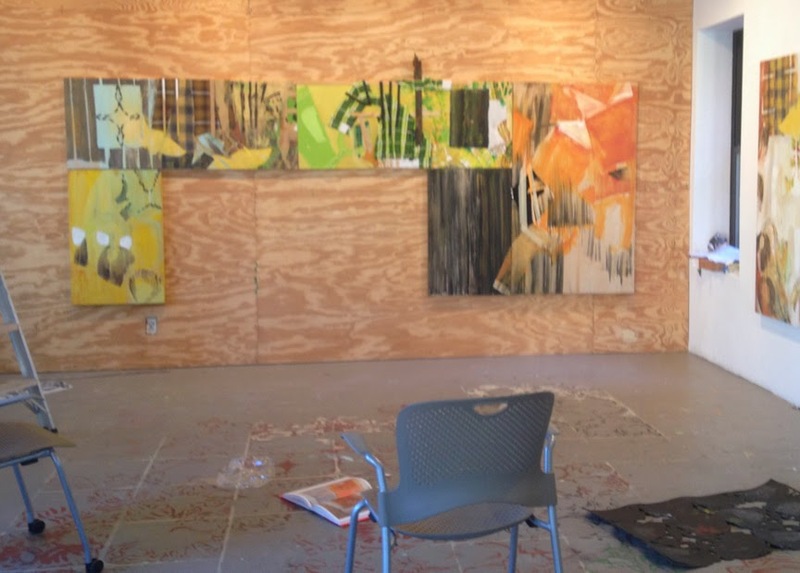 In her earlier work, for instance, she felt compelled to work with archival materials; now that concerns her far less. She has come to realize that in our culture, everything is provisional. Suzanne Joelson, About Face, mixed media, 20 x 16 inches.